Ricky Gervais came on to most people’s radar in 2001 with the breakout UK hit The Office. He followed with the under-appreciated Extras a few years later and went on to star in stand-up specials, podcasts, and hosting—some would say roasting at—The Golden Globes. After Life is the new series that recently premiered on Netflix. Gervais stars as Tony, a man struggling to find a reason to live after his wife’s death. This black comedy has all the biting humor we expect from the British comedian, who also wrote and directed all six episodes, but it also has a tender heart. 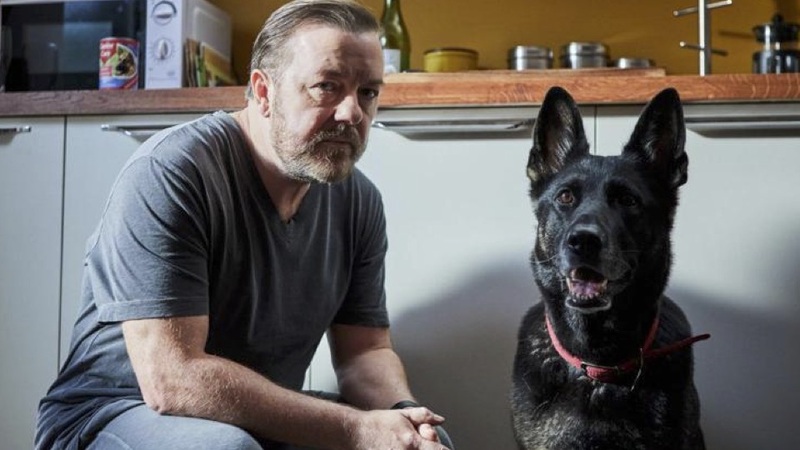 Gervais calls it his best work and a Netflix renewal guarantees extended life for the show. In After Life’s very first scene we meet Tony’s wife, Lisa (Kerry Godliman), in a sick-bed video she secretly recorded for her “lovely” but “f**king useless” husband to use as a guide after her death. It’s a brief encounter, but it speaks volumes. The camera pans to Tony watching in bed and we understand why his heart is where it is …. in a terminal way. Gervais could have introduced us to his character’s deceased wife through traditional reminiscences or flashbacks. Showing her husband watching the video on a laptop draws us in while making us painfully aware of the many “Tonys” watching similar videos or replaying last voicemails to soak up what precious little remains of their loved ones. Those keepsakes are comforts but also barriers to the living who are moving on. This is where we find Tony at the series’ start: stuck in a moment, indifferent to the needs of the here and now and wanting nothing but to join his wife. In her video guide, Lisa tells her husband not to forget to feed the dog; sure enough, Tony’s forgotten to buy dog food and offers his whimpering canine a choice between the only two canned goods left in the cupboard: baked beans or vegetable curry. He gives the dog the beans, then looks at the counter full of dirty dishes and, wincing, downs a cold can of vegetable curry for breakfast. As Tony goes through the motions at home, a young woman walks across a sunny English square into the office of the local newspaper, reporting for her first day of work—all to the cheery sounds of Bill Withers’ “Lovely Day.” Cut to Tony tossing a rope toy to dog Brandy at a local park and we’re lulled into believing this could be a side of Gervais we haven’t seen before—or ever—poignant, uplifting even. “Dogs should be on a lead. Can’t you read? The park’s for everyone,” the stranger says, pointing to a signpost behind him. Now that’s the Ricky we’ve come to expect. In fact, Gervais told Late Night’s Seth Meyers recently that playing the part of someone who feels he’s nothing to lose allowed him to let his inner curmudgeon off its chain. Besides the nosy stranger in the park, Tony has run-ins with his new mail carrier (“Postman Pat”) and a local schoolyard bully, who calls him “Pedo.” Tony’s response is wickedly funny and a subsequent interaction with the boy comes back to bite Tony later in the series. Tom Basden, who starred alongside Gervais in David Brent: Life On The Road, plays Tony’s brother-in-law and boss Matt, a sympathetic type who nevertheless grows increasingly concerned as Tony falls into a cantankerous funk (something Tony thinks of as a superpower). Tony has ceased caring about his role at the freebie Tambury Gazette and when Matt tries to encourage professionalism Tony says there’s no advantage to “being nice and thoughtful and caring,” citing instead how the staff takes advantage of Matt’s too-trusting nature. Kath, played by Diane Morgan, is one of those staffers—the hall monitor of the office—who becomes an easy target for the unmoored Tony. Others in Tony’s orbit include Sandy (Mandeep Dhillon), the aforementioned aspiring journalist he begrudgingly takes under his broken wing, and his inappropriate therapist, played by Paul Kaye, who was also in Game of Thrones. Many of the roles are filled by actors that Gervais has worked with before, like the aforementioned Basden and a couple of gems from Extras’ cast: Tony Wray, who plays Gervais’ Tony’s loyal and tolerant friend and Ashley Jensen, who is the less-enamored nurse caring for Tony’s Alzheimers-afflicted dad. She’s just one of the many in Tony’s sphere who will test his belief that he has nothing left to lose. After Life is a brilliant amalgam of Gervais’ cranky, dark take on an especially tricky chapter in life. And he (as always) leaves us laughing (even when it’s not appropriate).